When you think about yoga, Steve Jobs may not be the first person that comes to mind. Steve Jobs: the late founder of Apple computers and a great visionary, was also a quietly spiritual man. According to friends and colleagues in a recent interview (see video below), Steve had taken a trip to India and studied in ashrams, and read the book "Autobiography of a Yogi" by Paramahansa Yogananda, which prompted him to begin a path of self actualization and realization. At Jobs' memorial service in 2011, hundreds of attendees received a copy of the book "Autobiography of a Yogi" as a gift from Jobs. Many saw this as a message that he wanted to inspire others to begin a path to self actualization and realization also. It is truly remarkable to see someone who lived their life so purposefully, use also their death as a way to inspire others and perpetuate purposeful living. 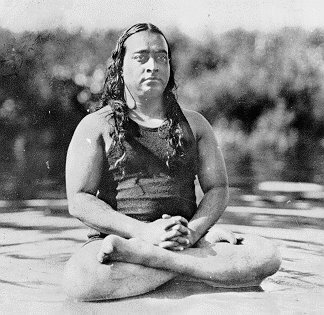 Paramahansa Yogananda was a Hindu guru, who was among the first to come to the West from India to teach yoga for an extended period of time. Many of Yogananda's teachings continue to be passed down through the Self Realization Fellowship, which he founded in 1920. You may recognize Yogananda from this familiar picture hanging on the wall in our studio. Yogananda taught yoga to many, including his brother, Bishnu Ghosh, who was the yoga guru to our teacher, Bikram Choudhury. The Bikram Yoga lineage is rich with yogic knowledge, experience, and history, which we continue to honor and study. We encourage you to pick up a copy of "Autobiography of a Yogi" in the BYAZ boutique and immerse yourself in the incredible teachings of Yogananda, just as Steve Jobs did. Through the sage teachings we can become more self actualized and realized and create the best life and world for ourselves to live in.